Here are some simple tips to help you with interview process!!!! If you not sure or don't fully understand a question, respond by saying 'do you mean....' therefore you not worn and they'll explain what they mean! Provide example to your points with regards to your skills/achievements! Here are some things not to do during an interview!!! Don't leave your mobile phone on. 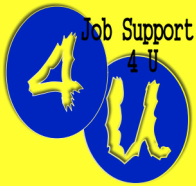 If you want more Do's & Don'ts when it comes to interviews, then click on any of the links below for the Job Support 4 U Interview Do's & Don'ts!